Gary Gibbon talks to Liberal Democrat leader Nick Clegg about his differences with David Cameron, spending cuts and abolishing the party's tuition fee pledge. 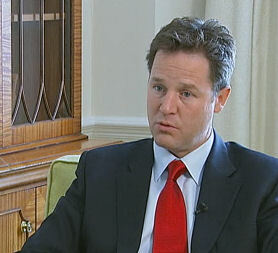 On David Cameron's suggestions that the difference between the Conservatives and the Liberal Democrats was not that great, Clegg said: "It's very important in the run-up to a general election not to wish away the differences between parties, but to give people a choice, and there are big choices that we need to make about what the next government is to do. "We can all airbrush away our differences, but lets remember we have got to change, so the question is what kind of change. I think he offers phoney change. I think we, the Liberal Democrats, offer much more substantive real change for good." He dismissed suggestions that he would consider going into a coalition government with the Conservative party. "My ambitions go a lot, lot further than speculating fruitlessly about what might or might not happen after the next general election," he said. "Certainly my ambitions are far in excess of hoping to somehow cling on to the coat tails and play second fiddle to another party." On the difficulties in going into a general election campaign talking about cuts, Clegg said: "I think it is off-putting if the choice before the British people is just a choice between three hatchet-faced accountants. "You have got to be driven by values, and it is precisely to be able to provide, to free up money to put in to those priorities that you do need to take very difficult and bold decisions elsewhere." He said that the party needed to be "credible in delivering" the policies they put forward, and that was part of the motivation for dropping the flagship policy of abolishing university tuition fees. "Would I like to scrap [tuition fees]? Yes. Am I going to pretend, however, that a spending pledge of £2.5bn a year is not a difficult one to meet at a time when the public finances have basically blown up in our faces? Of course I'm not. "There is not point in having a unique selling point if you can't be credible in delivering it. I will not, as a leader of the Liberal Democrats, make promises that we cannot keep. "When the world changes utterly around you, it is sensible to change with it." He said the strategy in Afghanistan was "doomed to failure". "I am unambiguous in saying that the Liberal democrats support is not unconditional, we are not going to sit around and support a strategy we feel is failing, where brave British servicemen and servicewomen are dying in pursuit of a strategy which is not working."